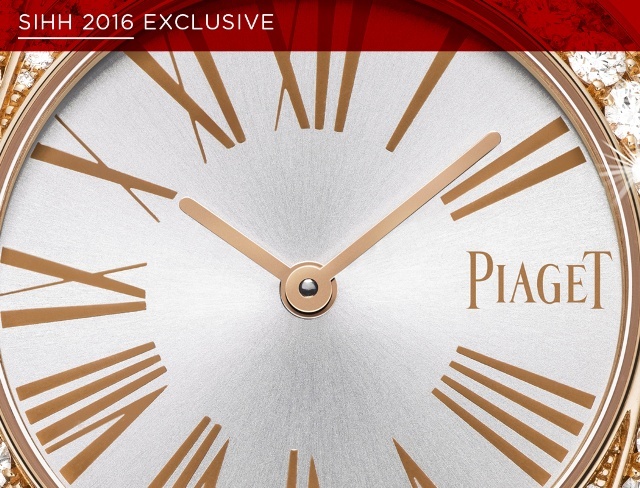 Piaget’s expertise with ultra-thin mechanical movements and watches is well known. But are you aware that Piaget also helped pioneer quartz timekeeping and has long made its own ultra-thin quartz movements? Piaget was member of the famed Swiss consortium that developed the Beta series of early quartz movements in the late 1960s and into the early 1970s. By 1976 Piaget began to produce a line of thin quartz movements, starting with the Piaget 7P, the thinnest of its type at the time. Since then Piaget has used its quartz movements inside its ladies’ collections and its jewelry watches. 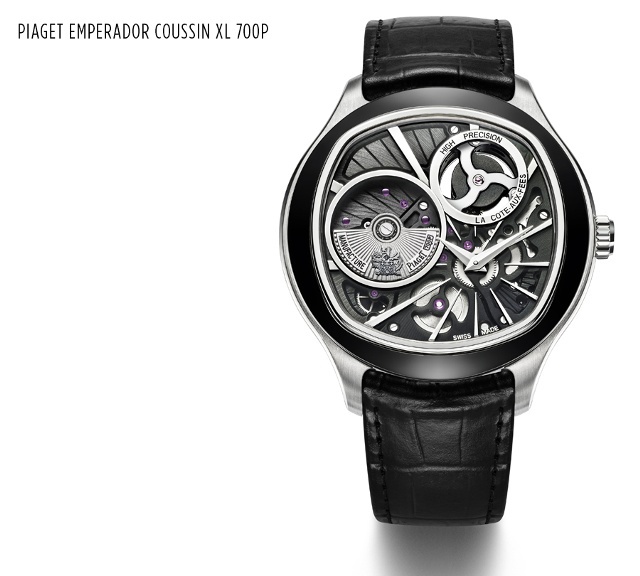 To celebrate the 40th anniversary of the Piaget 7P in-house quartz movement, Piaget at SIHH 2016 unveiled the Emperador Coussin XL 700P: a concept watch with a generator-regulated mechanical movement, issued in a 118-piece limited series. The new watch’s name is a play on the name of the 7P caliber from 1976. The movement inside the new watch is regulated by the high frequency of quartz oscillating at 32,768Hz that controls the speed of a generator turning at 5.33 turns per second. The quartz controls the rotation of the generator and wheels train to ensure an extremely high degree of precision, according to Piaget, as well as perfect resistance to magnetic fields and gravity. This new caliber, for which at least ten patents have been filed, stems from two years of research, all based on an original Swiss concept first registered in 1972. The dial side of this 46.5mm white gold Emperador Coussin XL 700P features a very visible guilloché micro-rotor adorned with the Piaget coat-of-arms, sunburst and chamfered bridges, circular stain-brushed wheels and silver-toned screws. The caliber’s deep black shade is matched by a black ADLC-coated gold bezel. Piaget also expands its ladies’ Limelight series of high-fashion watches with Limelight Gala (left). Just as Piaget was developing its in-house collection of quartz movements it was making stylish Limelight watches powered by these calibers. Piaget cuff watches, necklace models and thin gold and diamond models (often with richly colored gemstone dials) were frequently worn by celebrities and jet setters of the era. 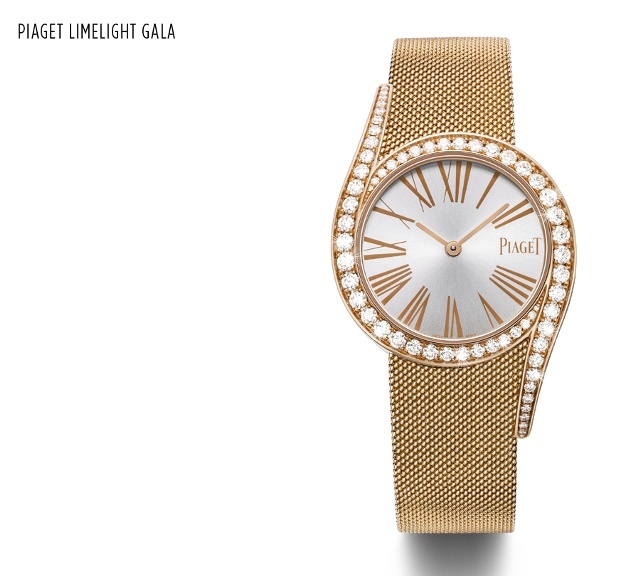 The Limelight Gala, featuring a shape Piaget revisited for the first time in 2013 (on a satin strap), in 2016 appears clad in gold and held tight with a gold Milanese mesh strap. Each case is set with sixty-two brilliant-cut diamonds while each dial offers gold-toned Roman numerals. The matching white gold or pink gold Milanese mesh bracelets feature an integrated sliding clasp engraved with a for Piaget. Inside is Piaget quartz caliber 690P. 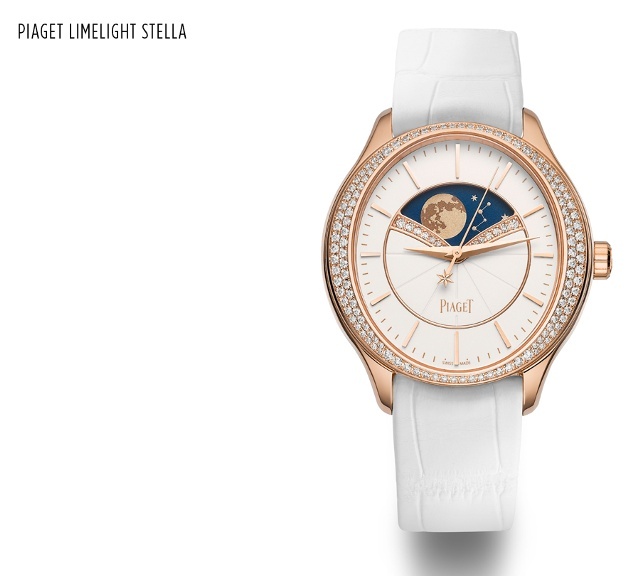 Earlier this year Piaget showed the 2016 debut Limelight Stella, a 36mm gold watch (with or without diamonds) with an unusually accurate astronomical moon function. The moon phases appear on a disc adorned with stars and two moons driven by a 135-toothed wheel, which displays the phases such that the Limelight Stella will require a one-day correction only after 122 years. The newly made in-house automatic Caliber 584P drives the hours, minutes, central seconds and moon phases at 12 o’clock. The movement’s finishing features a circular-grained mainplate, beveled bridges, circular Côtes de Genève, blued screws and the Piaget coat-of-arms engraved on the oscillating weight. For the jeweled version, Piaget employs its caliber 580P, which does away with the central seconds hand to highlight the jewelry work.